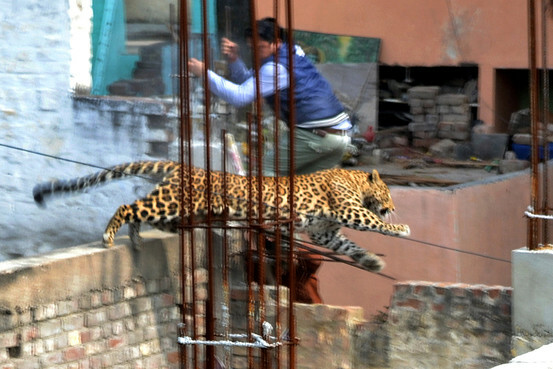 Leopard still on the prowl in northern Indian town of Meerut? 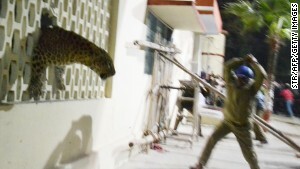 Meerut has been panicked by a leopard on the prowl, schools and colleges have been closed since the leopard was first spotted on Sunday in a warehouse and a person felt the power of the leopard as it attacked him and escaped. The leopard also entered a hospital and was locked in a room before the leopard escaped via a window and could not be tranquilised by the wildlife rescue teams called in to take this leopard away from the public and relocate it back to the forest. Many Police officers have been called in too as have army units, the town is on a high alert after the total number of people injuired has been 7. There was an opportunity for the wildlife rescue teams which went wrong after the crowds seemed to alert the leopard to their presence, at which point the leopard made a hasty escape. Deepankar Ghosh from The World Wildlife Foundation India gave the statement on what needs to be done after this dangerous encounter in Meerut and also the string of occurences throughout India, referring to other incidents such as in the eastern state of Chhattisgarh, where a leopard caused the death of a 5 year old boy and a female tiger which has caused the death of 8 men in a number of encounters and the many other incidents across India. The WWF’s call for an operational and organisational approach of forests and other habitats is vital as currently there is a problematic scenario of territorial corridors being blocked, with no access for the leopards without being detected by the communities scattered about near these routes. These largely territorial species need free corridors, their territories have been encroached upon, and there is a lack of space for the leopards to move around, the leopards need to find open corridors to move about, yet these have become narrower mainly due to the saturation of communities. India’s leopard population is numbered at 1,150 according to the 2011 census.